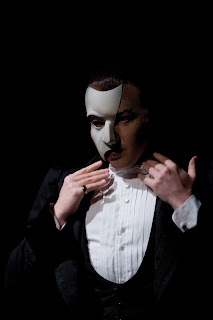 Cameron Mackintosh is delighted to present a spectacular new production of Andrew Lloyd Webber’s THE PHANTOM OF THE OPERA for its Scottish premiere at the Edinburgh Playhouse in September 2012. THE PHANTOM OF THE OPERA will star John Owen-Jones and Earl Carpenter, who will share the role of ‘The Phantom’ and Katie Hall who will play the role of ‘Christine’. Full tour schedule with casting details and on sale dates attached. John Owen-Jones is currently playing the role of ‘The Phantom’ in “The Phantom of the Opera” at Her Majesty’s Theatre in the West End. He has appeared on Broadway and in the West End as ‘Jean Valjean’ in “Les Misérables” and also played the role in the recent 25th Anniversary tour of the show. Earl Carpenter recently played the role of ‘Javert’ in the West End production of “Les Misérables” and also played the role in the 25th Anniversary tour of the show. He has also played ‘The Phantom’ in the West End production of “The Phantom of the Opera” as well as the starring role of ‘Darryl Van Horne’ in “The Witches of Eastwick” at the Prince of Wales Theatre, also in the West End. His touring credits include ‘Joe Gillis’ in “Sunset Boulevard”. Katie Hall was a boot camp contestant for the BBC1’s search for ‘Nancy’ in “I’d Do Anything” and was a final round contender for Andrew Lloyd Webber’s search for the Eurovision entry, “Your Country Needs You”, also for BBC1. After leaving the “I’d Do Anything” competition she was immediately cast to cover the role of ‘Christine’ in “The Phantom of the Opera” at Her Majesty’s Theatre and is now the alternate ‘Christine’ in the production. Katie has also played the role of ‘Cosette’ in “Les Misérables” at the Queen’s Theatre in the West End, on the 25th Anniversary tour and also at the O2. This spectacular new production is directed by Laurence Connor, with choreography by Scott Ambler, Set Design by Paul Brown, Costume Design by Maria Björnson, Lighting Design by Paule Constable and Sound Design by Mick Potter. The production is overseen by Cameron Mackintosh and Matthew Bourne. THE PHANTOM OF THE OPERA became the longest running show in Broadway history on 9 January 2006 when it celebrated its 7,486th performance, surpassing the previous record holder “Cats”. This coincided with the Broadway and the US national touring company celebrating an unprecedented 20,000 performances in the United States. In October 2010 the London production celebrated its 10,000th performance. THE PHANTOM OF THE OPERA has won over 60 major theatre awards, including seven Tonys on Broadway and three Olivier Awards in the West End. It won the ‘Most Popular Musical Audience Award’, voted by the public, in the 2002 Laurence Olivier Awards. THE PHANTOM OF THE OPERA, which opened at Her Majesty's Theatre on 9 October 1986 starred Michael Crawford as 'The Phantom' and Sarah Brightman as 'Christine.' It is produced by Cameron Mackintosh by arrangement with The Really Useful Group. Worldwide, THE PHANTOM OF THE OPERA has grossed over £3.2 billion. The box office revenues are higher than any film or stage play in history, including "Titanic", "ET", "Star Wars" and “Avatar”. It has been seen in 145 cities in 27 countries and played to over 130 million people. THE PHANTOM OF THE OPERA is currently showing in London, New York, Budapest, Las Vegas, and Kyoto. Other Tour dates - Theatre Royal Plymouth (27 February-31 March 2012), Manchester Palace (4 April-19 May), Bristol Hippodrome (22 May-30 June), Dublin Grand Canal (4 July-4 August), Leeds Grand (8 August-15 September), Edinburgh Playhouse (19 September-20 October), Milton Keynes Theatre (24 October-24 November), Cardiff Millennium Centre (4 December-12 January 2013) and Southampton Mayflower (22 January-16 February).